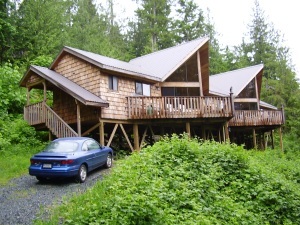 Desolation Resort is located on Okeover Arm in Lund BC. You can reach the resort by travelling to Powell River BC and then continuing north on Hwy 101 for about 40 minutes. 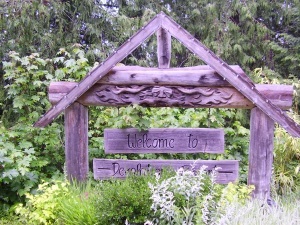 There are plenty of signs as you enter the village of Lund to direct you to the Desolation Resort. Desolation Resort has been built over the last 12 years and is operated by Josaphine & Bernd Scheifele. There are 18 units on the property which is just over 7.5 acres. The cottages and chalets have been built over time, and the are simply charming. They are true west coast buildings, featuring some of the wood from the property and was built using local Powell River and area artisans and wood workers. The 18 units are all self contained and some of the units are pet friendly. Make sure that you indicate when reserving if you are travelling with a pet. The units feature beautiful wood floors and wood detailing. Beautifully tiled bathrooms with over size showers and hot tubs in some units. Fully kitchen including fridge, stove, microwave and coffee maker. The kitchens are full stocked with cutlery, dishes, pots and pans, ets. Just bring your goodies and food. Ther are even BBQ's to grill up your catch or steam open some oysters over the hot grill.